We love it when the stuff of sci-fi makes its way into the real world, and that means this week has been particularly cheery: we can pretend to be Master Chief, start saving for our driverless cars and prepare to control the Xbox One with our eyes. 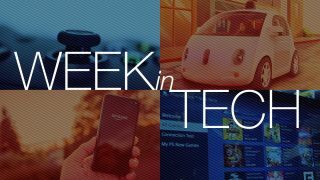 And that's not all: we've got stacks of PS4 goodies, the verdict on Amazon's odd phone and the maddest Mac we've seen for ages. It can only be Week in Tech! Microsoft's Cortana, the clever virtual assistant, is finally available in the UK - sort of. As James Rogerson reports, "Cortana is now here for those that want it. But don't pull out the party poppers yet." Cortana is still a developer preview, so getting hold of her may void your warranty and cause a Covenant invasion. Cortana isn't the only futuristic tech coming to the UK. Driverless cars are coming too. The UK's Department of Transport is reviewing the law to ensure that self-driving cars can be tested on UK roads, and the first ones should be trundling around early next year. If you listen carefully you'll hear the sound of parents cheering, delighted that their kids will soon be back at school. But what tech should they take with them? We've picked the very best laptops for students and the best laptops for everyone. Not only that, but we've also identified the 1,000 best gadgets in the world today. Sony's PlayStation Now service has launched in open beta in the US and Canada, enabling players to stream PS3 games to PS4. It's pretty good, says Nick Pino, but rentals are pricey. The launch explains why Sony doesn't seem keen on EA Access, the gaming firm's "Netflix for games" that's available on Xbox One. Sony reckons its own PS Plus service is better value. That doesn't mean Sony's current offerings are perfect, though, and Louise Blain has detailed 13 new features the PS4 really, really needs to rise to the top. Microsoft's Xbox One is getting 3D Blu-ray support this week with the PS4 following suit a few days later, but it seems that Microsoft wants to make games even more realistic: it's working on eye-tracking tech that, in conjunction with virtual reality headsets and Kinect, could deliver some truly extraordinary gaming experiences. Amazon Fire - amazing or dire? Is the much-hyped Amazon Fire Phone as good as we hoped? Nope, but that doesn't mean it's a complete dud either, says Marc Flores. It's decently made, but while the specs are OK the price isn't. "It doesn't feel like Amazon gave this phone much thought," Flores says. Apple's preparing a revamped iMac for release later this year, and there's one question every Mac fan wants to know: will it be 4K? Rumours suggest the incoming 27-incher may be just that, and we might even get a new Mac Mini too. Fancy a retina MacBook Pro tablet? Apple won't make you one - or at least, it won't in the foreseeable future - but Modbook will. The Modbook Pro X takes a 15-inch rMBP and turns it into a tablet for the princely sum of around £1,200, and the firm is currently looking for backers on Kickstarter.